Baby laptops and other electronic toys that promise to improve children's language skills could be all talk. New research suggests that electronic toys are waste of money when it comes to a baby's development, and they may be better off playing with a humble set of wooden blocks. The study, recently published in Journal of the American Medical Association Pediatrics, found that electronic gadgets decreased the quantity and quality of a baby's language compared to books and traditional toys, such as wooden blocks and puzzles. "These results provide a basis for discouraging the purchases of electronic toys that are promoted as educational and are often quite expensive," researcher Dr Anna Sosa​ concluded. It feeds into a growing body of research that raises concerns about the effect of electronic toys on a child's health and development. The study involved placing recording devices on 26 babies aged between 10 months and 16 months old, while researchers remotely observed their play sessions with mum and dad. Parents said an average of almost 40 words per minute when playing with electronic toys with their babies, compared with 56 words per minute for traditional toys and 67 words per minute with books. Babies also vocalised less when playing with the electronic toys, which included a baby laptop, a talking farm and a baby mobile phone. These gadgets – which were marketed as educational toys that promoted language development – were actually found to reduce verbal interactions between child and parent. While these interactions may involve a lot of baby babble, they "lay the groundwork for literacy skills", teach role-playing and promote social skills such as how to take turns. "Electronic toys make children consumers while traditional toys make them creators," said Irina Verenikina​, an associate professor of educational psychology at the University of Wollongong. "You can't do much with electronic toys. They impose sounds and noises. The babies are excited for a few days, and then they get bored." Dr Verenikina has researched digital play, such as iPad apps, and found it can limit a child's learning experience by not engaging all of the senses. She said some parents used apps as virtual babysitters, and they could become addictive for children. But her Australian Research Council-funded project found that open-ended apps, such as ones that let children create stories and choose characters, encouraged creativity. Dr Verenikina is creating a set of guidelines to help parents and educators choose apps that are developmentally beneficial. It will operate a little bit like a Heart Foundation tick, she said. The Department of Health recommends that children younger than two should not watch television or use electronic media such as DVDs, computers and other electronic games. 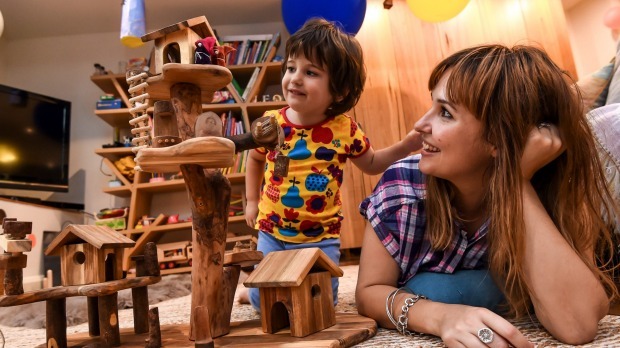 Kristy Biagini's Fitzroy apartment is a shrine to aesthetically pleasing wooden toys, which she rotates to ensure her son Leo, 3, is never bored. A favourite is an elaborate multi-storey treehouse with a miniature wooden ladder. He does owns mobile phone – but it is made out of wood. "When we play with traditional toys we end up talking more," she said. "I am making up stories and he is talking about what he is doing. He has a very good imagination"
There are no electronic toys in the house, and Leo is allowed to watch television for only 10 minutes a week. "He will sit on the couch, with his mouth open not moving for 10 minutes," she said. "He looks transfixed." Leo attends playgroup once a week at Sophia Mundi, a Steiner school in Abbotsford where he is surrounded by other children who play with wooden toys. Ms Biagini said she is often told that Leo's language skills are "really good". "He surprises me. All of a sudden he will say 'I'm disappointed'. He also tells great jokes."